Carboxylic acids are organic compounds with high boiling point. These are made up of two functional groups: carbonyl and hydroxyl. Carboxylic acid is used in several applications such as food & beverages, animal feed, pharmaceuticals, personal care & cosmetics, consumer goods, lubricants, and agriculture. It possesses a strong odor, especially volatile derivatives. The market for carboxylic acids is largely driven by growth of vinyl acetate monomer (VAM) in the food packaging industry and high demand for stearic, butyric, and valeric acid in the personal care & cosmetics industry. Rising usage of organic acids as growth promoters in the animal feed industry is likely to boost demand for carboxylic acid. However, stringent regulations regarding the production of petro-based carboxylic acids are expected to hamper the global carboxylic acids market. Furthermore, easy availability of substitutes in various end-use industries is likely to inhibit market growth. In terms of volume, acetic acid was the largest product segment of the global carboxylic acids market in 2014. It is majorly used in the production of vinyl acetate monomer (VAM), PTA, acetic anhydride, etc. The segment is anticipated to exhibit the fastest growth rate from 2015 to 2023. Stearic acid, a straight chain saturated fatty acid, is extensively used in adhesives & sealants, agrochemicals, chemical intermediates, additives, pigments, and surface active agents. Stearic acid held significant share of the global carboxylic acids market in 2014. The citric acid segment is expected to expand at an above average rate during the forecast period owing to increasing usage of the acid to impart tart flavor in the food & beverages industry. Formic acid, propionic acid, and butyric acid are projected to expand at a moderate rate due to high demand for these acids in animal feed and silage & grain preservation applications. Isovaleric acid, known for its strong sweaty odor, and hence used in wine manufacturing in smaller quantities. In terms of volume, consumer goods was the largest end-user segment of the global carboxylic acids market in 2014. Other end-use industries such as textile, leather, chemical intermediate, and agrochemicals are projected to witness the fastest growth during the forecast period. Carboxylic acids are largely used in the production of their derivatives such as stearates, ester solvents, and ester lubricants. In terms of volume, lubricants segment accounted for significant share of the global carboxylic acids market in 2014. Carboxylic acids such as caproic acid, stearic acid, and valeric acid are widely used in the manufacture of lubricants. Carboxylic acid is used as an active ingredient in several drug formulations such as non-steroidal anti-inflammatory drugs (NSAIDs), anticoagulants, antibiotics, and cholesterol-lowering statins. Growth in geriatric population is estimated to drive the pharmaceuticals segment during the forecast period. Similarly, rising demand for bio-based personal care & cosmetic products is boosting the carboxylic acid market, especially in developed countries. Asia Pacific constituted the largest share of 56.04% of the global carboxylic acid market in 2014. Food & beverages, consumer goods, lubricants, and others are the most lucrative segments of the carboxylic acid market in the region. Asia Pacific is also emerging as the new epicenter for the production of bio-based and synthetic chemicals. China leads the market, with the addition of new capacities for carboxylic acids such as valeric acid, isovaleric acid, and isobutyric acid. North America is expected to outpace Europe by 2023 due to increasing demand for carboxylic acids in food & beverages and pharmaceutical industries. The carboxylic acids market in Europe is expected to expand at a sluggish rate during the forecast period. 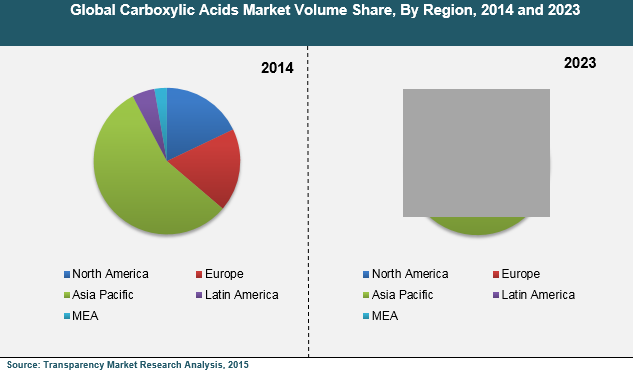 Latin America and Middle East & Africa are anticipated to offer immense growth opportunities for the carboxylic acids market in the next few years. The global carboxylic acids market is highly fragmented; various small players operate in Asia Pacific. Major players in the global carboxylic acids market include Celanese Corporation, BASF SE, The Dow Chemical Company, Eastman Chemical Company, and Jiangsu Sopo (Group) Co. Ltd.
Carboxylic acids are organic acids containing carboxyl group (-COOH). These acids are named according to the number of carbon atoms present in the molecule. Carboxylic acids are primarily used in the manufacture of soaps, detergents, pharmaceuticals, rubber, plastics, dyes, textile, perfumes, and animal feed. Rising demand for carboxylic acids derivatives is anticipated to boost the global market for these acids during the forecast period. Additionally, increasing demand for acids such as formic, propionic, and butyric in the animal feed industry is estimated to drive the market. However, factors such as enactment of stringent government regulations on the production of petro-based carboxylic acids and availability of organic and natural substitutes in the animal feed industry hamper the carboxylic acid market. This report provides detailed description of the global carboxylic acids market in terms of volume share (Kilo Tons) and revenue (US$ Mn) for the period from 2014 to 2023. It highlights factors contributing to the growth of the market. It also enumerates the restraints faced by the market. The market is described with respect to various segments along with opportunities that are expected to arise during the next six years. The carboxylic acids market has been segmented based on products such as acetic acid, valeric acids, isovaleric acid, formic acid, propionic acid, butyric acid, isobutyric acid, citric acid, caproic acid, and stearic acid. It is also segmented on the basis of end-user industries such as food & beverages, animal feed, personal care & cosmetics, lubricants, consumer goods, and others (including agrochemicals, chemical intermediary, textile, electronics, rubber, and leather). The study provides forecast and estimates for each product segment and end-user in terms of revenue and volume during the forecast period from 2015 to 2023. Each of the product segments and end-users has been further analyzed on regional (North America, Europe, Asia Pacific, Latin America and Middle East & Africa) and country levels for the period from 2014 to 2023 in terms of volume and revenue. Value chain analysis and Porter’s five forces model have been provided for a comprehensive view of the market. These throw light on the dynamics of the industry structure besides providing an overview of the degree of competitiveness in the market. The report also includes the manufacturing process of major carboxylic acids and price trend analysis of carboxylic acids from 2014 to 2023. Additionally, the report includes key research findings through primary interviews with major industry experts and opinion leaders in order to substantiate the secondary research. Secondary research sources referred to include company websites, annual reports, broker reports, investor presentations, financial reports, and SEC filings. In-depth interviews and discussions with a wide range of key industry participants and opinion leaders were conducted to compile this research report. Primary research represents bulk of research efforts, supplemented by an extensive secondary research. Key players’ product literature, annual reports, press releases, and relevant documents were reviewed for competitive analysis and market understanding. This helped in validating and strengthening secondary research findings. Primary research further developed the analysis team’s expertise and market understanding. The report covers a detailed competitive outlook that includes market share and profiles of key participants operating in the global market. Key players profiled in the report include BASF SE, Eastman Chemical Company, Celanese Corporation, The Dow Chemical Company, OXEA, Perstorp Holdings AB, LyondellBasell Industries N.V., and Finetech Industry Limited. Company profiles include attributes such as company overview, business overview, product portfolio, key competitors, business strategies, financial overview (financial year), and recent/key developments.